When I was learning nalbinding in 2009 I was browsing the internet in hope to find patterns for nalbound mittens and socks. Since then I have seen also many other new nalbinders looking for patterns. It is a bit difficult, however, to give precise patterns for nalbinding items with exact stitch counts because many things affect the outcome: The yarn you have chosen, the stitch type you are using, as well as personal gauge. In knitting and crocheting you can change the size of needles or hook, but in nalbinding that doesn't work. That's why it is often best to make nalbound mittens by trying them on several times while making them, or to compare them to old mittens or a drawn outline pattern. You can find some ready-to-use outline patterns, and tips for drawing your own patterns here. Click on the numbers. More detailed description of each video at the bottom of this page. UPDATED 8/14, in English now! Instead of a nalbinding needle, you could use a blunt darning needle or a rya needle. A wooden popsicle stick or an invalid plastic card will quite easily turn into a substitute for a nalbinding needle. A hair clip may also work nicely. For the first experiments I recommend you would choose a yarn that is rather light in colour, and rather thick and tightly spun so that it is easier to see which loops to pick up. If you are using a loosely spun yarn at the beginning, it may be very difficult to see which ply belongs to which loop, and what to pick up onto the needle. In knitting and crocheting the yarn comes from a ball, but in nalbinding you need to cut suitable lenghts of yarn to work with, just like when sewing by hand, or embroidering. At first, when practising, 1 or 2 fathoms may be enough, but later on you may want to take longer pieces of yarn, up to some 6 to 8 fathoms perhaps, to avoid unnecessary splicing. I warmly recommend making both mittens (or socks) at the same time, in turns, for example one fathom at a time, or a couple of rows at a time. It is also good to check every now and then that you have a matching number of stitches in both mittens. By that way it is easier to remember the increases or decreases, and to get two equal sized and shaped mittens (or socks). In nalbinding your work grows to the opposite direction compared to knitting and crocheting. If you are right-handed, your work progresses from left to right. Finnish Stitch 2+2 (UUOO/UUOOO). Voiceover both in English and Finnish. Every nalbinder seems to have her/his own preferred ways of working, so there are many 'right' ways of doing things, meaning that also these videos are only guiding. 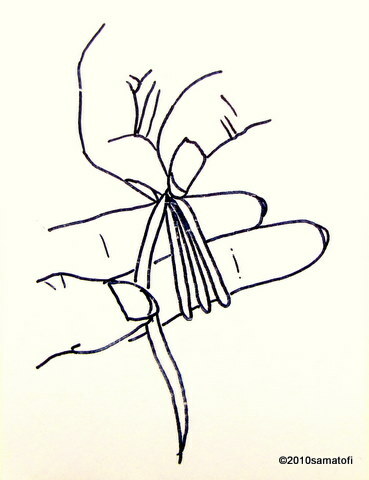 Placement of the thumb in a square shaped mittens. At first it is best to learn yourself only one way how to start, and one nalbinding stitch. When you get the idea of nalbinding, it is later on easy to try other stitches, too, if you are interested in. Though, many people use mostly only one or two stitches. Step by Step -tab gives you a drop-down menu from which you can choose the written instructions: How to make mittens top down, and cuff up, how to splice, how to increase and decrease, how to make the second row, how to make the thumb, how to finish off, and outline patterns for mittens.